Spotted Tail Productions produces films that attempt to capture the full experience of "the Quiet Sport", documenting angling success alongside utter failure - all with the fervor of a preoccupation turned obsession. STP has recently released a DVD called Upstream. Upstream is about Alaska, our country's last frontier. 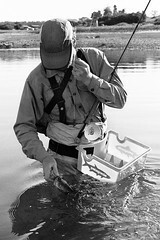 It is home to some of the wildest water and biggest freshwater fish that you can chase with a fly rod. 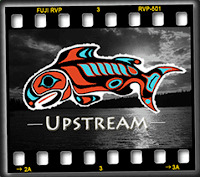 Upstream's essence captures a guide season on film and it tells the remarkable tale of the Alaskan salmon spawning ritual that plays such a large part in the state's ecosystem and economy. Check out the 3 minute Upstream trailer. Drop by the Spotted Tail Productions web site for more information. I hope they comp'd a copy of 'Upstream' to the guys at 'Way Upstream'. Ha! Capt. Andy Parker says there's a DVD on the way IT Guy. I'll let you know when it arrives.